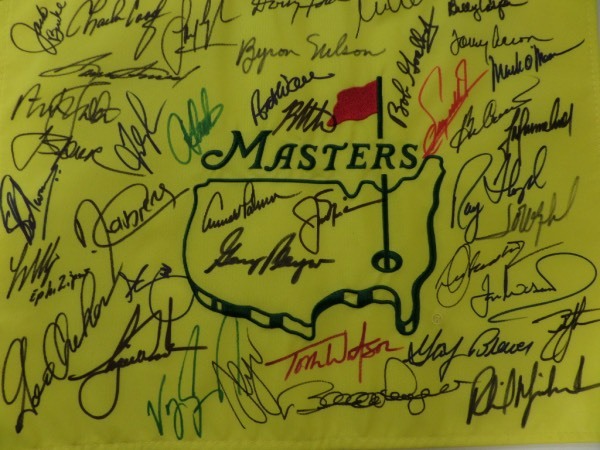 Coach's Corner - Masters Winners group signed golf pin flag. Go Back to Lot List Masters Winners group signed golf pin flag. This is the 13th pin flag we have sold, with ZERO returns! It is well made, a real pin flag from Augusta, site of the prestigious Masters Tournament, and comes sharpie signed by about 30 previous winners. No garbage here, just winners, and names like Mickleson, Palmer, Nicklaus, Watson, Sinjh, Floyd, Player, Byron Nelson, Tiger Woods, Casper, O'Meara and a ton more! Grade is a clean, bold and IN PERSON obtained 10, and values can reach mid-thousands on a solid sports buy and hold investment such as this.